Bing and Yahoo! searches use Bing search engine for indexing and crawling the web content. Bing has over 15% of the search engine market share in US with increasing user base. When you have a new website, we recommend submitting the site to Bing to improve the search results in Bing and Yahoo! search results. This will help to drive traffic especially when you are not able to get traffic from Google search. In order to submit your site to Bing search engine, Microsoft offers a dedicated Webmaster Tools. You can use your Microsoft, Google or Facebook account to register for Bing Webmasters Tools. Microsoft also offers $100 free Bing Ads coupon code for new webmaster signing up for webmaster tools account. So, you can simply register and use the coupon to drive initial traffic. After login to your account the first thing is to add your site. Your site will be added in the dashboard with the message “Site Ownership not Verified”. Clicking on the Verify Now link will provide you three options to verify your site. Copy and paste the meta tag in your site header area and click on Verify button. You can check under Configure My Site > Verify Ownership to make sure your site is verified successfully. Learn more about adding and verifying site in Bing Webmaster Tools. There are also other sections like dashboard, security and messages. You can get the overview of any single site under “Dashboard” section and check the notifications under “Messages” section. Let us discuss few important options in detail. Under “Configure My Site” section, you can submit Sitemap, submit URLs, setup crawl control, disavow links, block URLs, verify site ownership and setup geo-targeting. One of the important use of webmaster tools account is to submit your sitemap. Submit your sitemap to inform Bing search engine about all your web pages and the structure of your site. Select Sitemaps under “Configure My Site” tab, enter your Sitemap and submit. You can also submit your blog’s RSS feed to update Bing search engine about the latest post in your blog. After submission the status will be pending and Bing may take few days to a week time for checking and indexing the submitted pages in database. The status will be changed to “Success” once submitted pages are indexed successfully. Reports & Data section offers various reports for understanding the performance of your site. “Page Traffic” report provides you a detailed insight of how many times your page appeared in the search, average search position and click through rate for each of your pages. Select the view link under search keywords will provide you more information about each keyword which brought traffic to your site. This will give you how each page of your site is performing and what is the improvement required on non-performing pages to bring more traffic. SEO reports provides you the issues in your web page, inbound link provides the number of inbound links pointing to your web page and the crawl information provides you the latest crawling date and related errors. Bing provides exhaustive diagnostics tools to optimize your site for better ranking in search engine results pages. With Keyword Research Tool you can enter a keyword and find out the number of times your site appeared in search along with the other keywords related to your search. Normally every search engine takes few days to a month time for crawling your site. You have an option to submit your site manually to Bing using “Fetch as Bingbot” option. 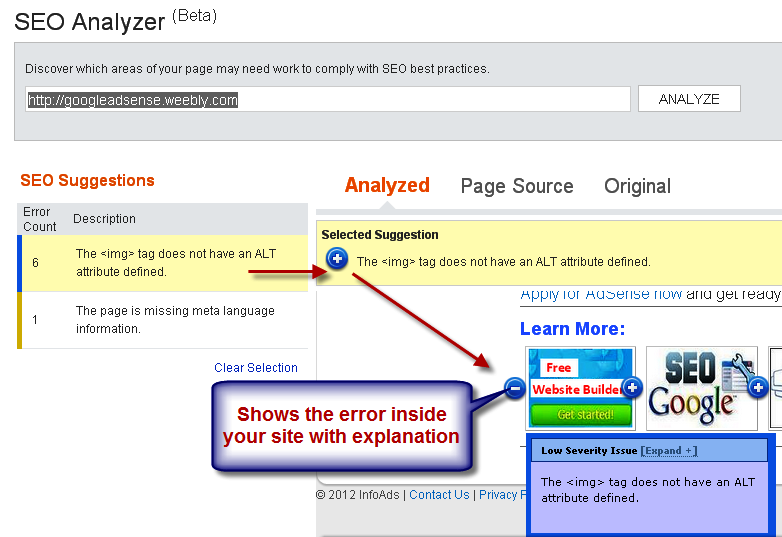 SEO Analyzer provides you the suggestion for optimizing you web page. The page with error will be opened in a small inside window and the webmaster Tools will point where exactly the error is by showing the point on that location of a web page. This will easily helps you to rectify the errors. 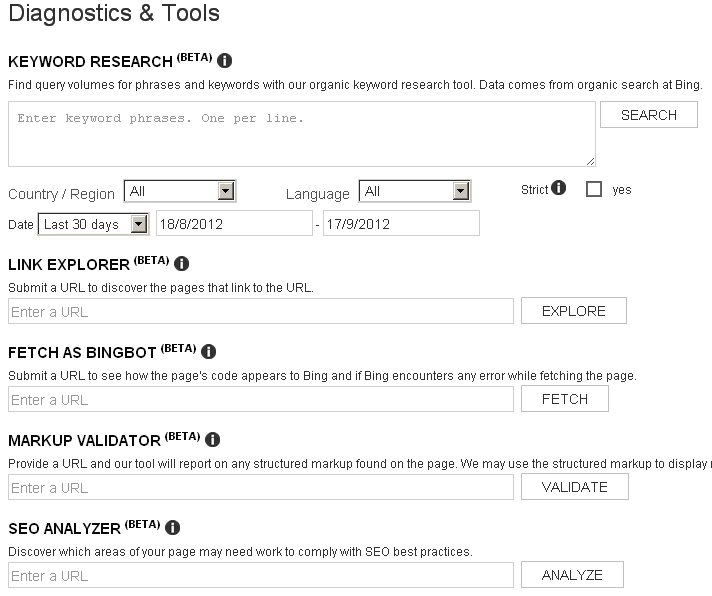 SEO Analyzer in Bing Webmaster Tools. All of these tools are in Beta version hoping Bing will come up with final version with more features.